Carson Wentz played a football game today. The Philadelphia Eagles eked out a nail-biter that came down to a pair of defensive stands to seal a win against Frank Reich, Andrew Luck, and the Indianapolis Colts. Oh, and Carson Wentz played for the first time since he tore his ACL and LCL last December! Wentz was also sacked five times, which, you know, isn't normally good, but maybe it wasn't the worst thing for him to be hit a number of times so that he could kind of get his feet wet? Is that dumb? Well, whatever. He stepped on a field again, and looked physically like he's going to be a problem for opposing defenses again in 2018 like he was a year ago. 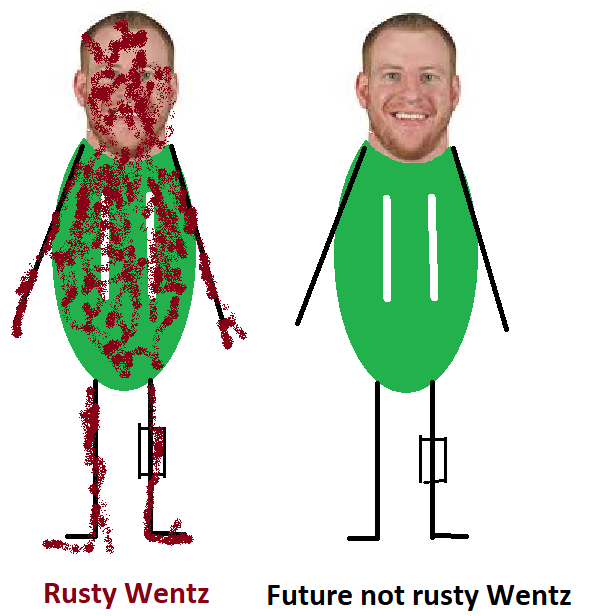 Of course, while Wentz looked good physically, he did not look the same mentally as he did a year ago. There were questionable decisions with the football, he was late on some throws, and he was unable to locate a few wide open receivers. In Week 1 against Atlanta, the Falcons entered the Eagles' red zone five times. They came away with one touchdown. On Sunday against Indianapolis, the Colts entered the Eagles' red zone five times, and and came away with, hey look at that (! ), just one touchdown again. The Eagles' offense put the defense in compromising positions throughout the day, but the defense stood tall in a game that was ultimately decided by one score. Red zone efficiency is kind of a big deal, both on offense and defense, and the Eagles' defense seems to tighten up when it matters. 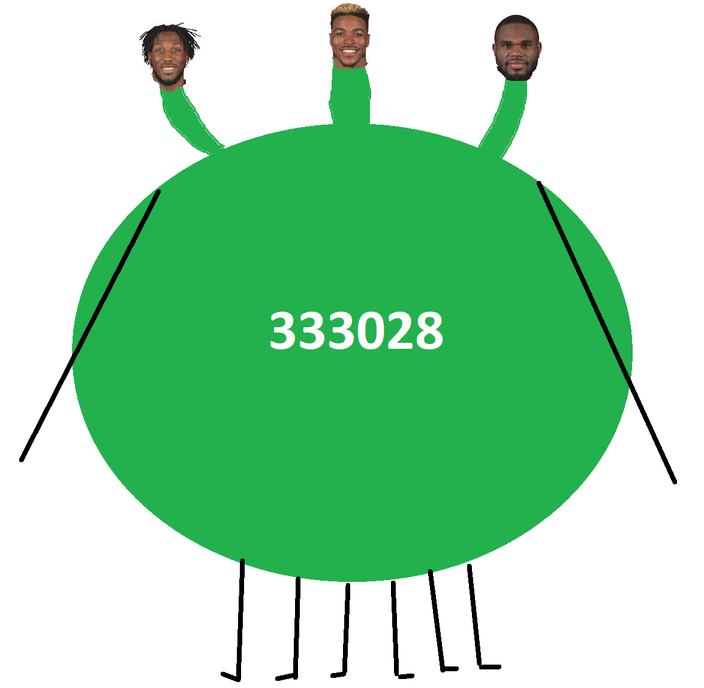 If they can just knock out the 75-yard touchdowns, they just might be OK. The Eagles were flagged 10 times for 110 yards on Sunday, a couple weeks after they were flagged 11 times for 101 yards against Atlanta. Against the Bucs Week 2, somehow they "only" had six penalties for 55 yards, though it seemed like it was worse than that considering at one point they faced a 2nd and 40 in that game. That's something they're going to have to clean up as the season progresses. Barnett made a habit of producing game-sealing sacks in college at Tennessee, and he came up with a huge play when the Eagles needed it the most. With Jay Ajayi and Darren Sproles out, the Eagles were down to just Clement, Smallwood, and Adams in the backfield. Given that fact, the Eagles were likely to shy away from pounding the run today, right? The Clement/Smallwood/Adams trio got 32 combined carries for 142 yards (4.4 YPC) and 1 TD. The "RUN THE BALL, ANDY" crowd was surely proud of Doug Pederson for sticking with the ground game. 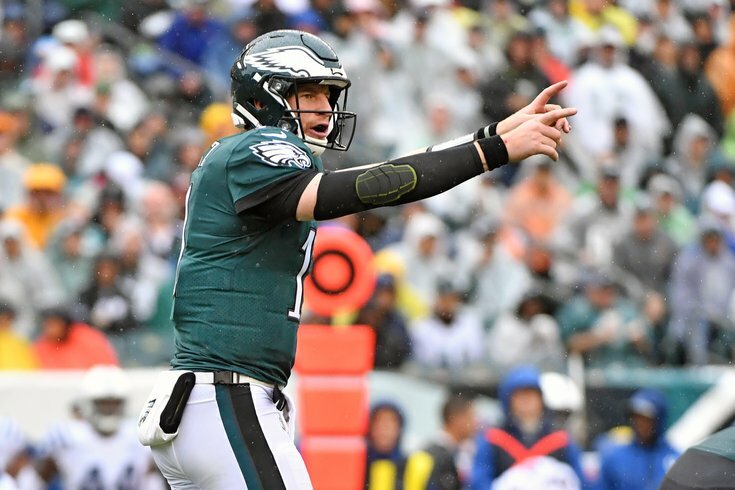 Pederson shied away from taking shots down the field on Sunday, which is understandable given that they were without Alshon Jeffery, Mike Wallace, and Mack Hollins, and the fact that it rained all day. They did take one shot deep to Nelson Agholor in the third quarter that fell incomplete, and a deep-ish throw to Zach Ertz that they completed. Otherwise, it was all short stuff. The likely return of Alshon Jeffery against the Tennessee Titans next Sunday should help open up the offense. In previous games, we were "Waiting for Goedert," but the Eagles opted not to use him much. Finally, the Eagles used him against the Colts, and the results were there. On the day, Goedert had 7 receptions on 7 targets for 73 yards and a touchdown. Luck completed 63 percent of his passes, and still only had an average yards per attempt of 4.1 yards. That's almost hard to do. This is kind of irrelevant to the Eagles going forward, but I don't think Luck can push the ball down the field. He's far from fully recovered from his shoulder injury. The Eagles are now 2-0 at home, and if you don't count the meaningless Week 17 game last year when the Eagles' JV lost to the Cowboys' varsity, the Eagles haven't lost at home since Week 14, 2016. 13 straight. Sort of.